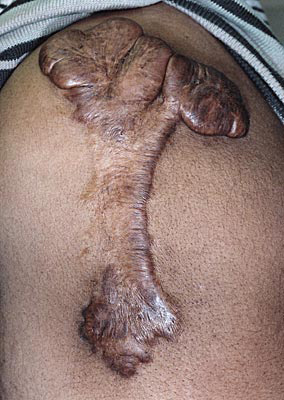 Abnormal healing of the skin occurs frequently in individuals with brown skin. When skin is injured, it may heal with one of several types of scars: normal (level with the surrounding skin), atrophic (depressed), hypertrophic (slightly raised), and keloidal (large and raised). Most injuries or wounds in people with skin of color heal with normal scars. However, when abnormal scars do develop in individuals of African, Latina and Asian descent, one of the most common types is keloidal scarring. Keloids are more likely to occur in individuals with a family history or genetic susceptibility. By definition, keloids are abnormally large scars that form at the site of an injury or trauma to the skin. These scars are unique because they overgrow the boundaries or margins of the original wound. The word keloid originated from the Greek word chele which means crab-like or claw-like. Hence, keloidal scars often have the appearance of a crab or a claw. 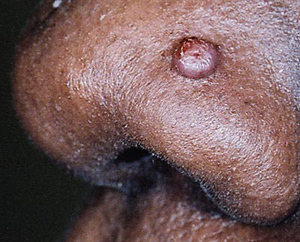 Keloids tend to develop between the ages of 10 and 30 years old, although they may appear at any age. They occur equally in males and females. Although keloids have been seen in people of all races, individuals with skin of color are affected more often than those of European descent. In a predominantly Black and Hispanic population, the incidence of keloid formation was found to be between 4.5% and 16%. In a study from Singapore of individuals with keloids, 56% were Chinese, 17% Malays, and 23% Indians. Trauma seems to be the most common reason for keloid development. The trauma may be from a cut, burn, vaccination, bug bite, or surgery. Things that you may not think of--a tattoo or ear piercing, a rash or even a bump from acne or ingrown hairs--may also cause a keloid. Unlike “normal” scars, keloids do not necessarily develop immediately after the injury or wound to the skin. The onset is often delayed by months or in some cases by years. Whereas the injury to the skin may be small, as in the case of ear piercing, keloids are inappropriately large. Keloids occur in various sizes and may grow rapidly over a short period of time in some individuals and slowly and steadily for many years in others. They can be located just about anywhere on the body, but occur most often on the earlobes, chest, back and arms. There are a variety of symptoms associated with keloids, which are probably due to abnormalities in the function of nerve fibers. The symptoms include itching, pain or tenderness, and burning. When itching of the keloid occurs, it is most often located at the edge of the keloid and may radiate into the surrounding normal skin. When pain occurs, it is usually located at the center of the keloid and does not radiate. Keloids are due to an over-production of scar tissue that is made of the building block of the skin, collagen. The exact cause of collagen over-production remains unclear, but is probably due to several factors. One is an abnormality in cells in the dermal layer of the skin called fibroblasts, which overproduce collagen, elastin, fibronectin, and proteoglygans and display abnormal responses to both stimulation and greater proliferative capacity. Additionally, there may be an abnormality in various growth factors in the skin, including one called transforming growth factor beta. Since we do not know the exact cause of keloids, we have not identified the perfect treatment. However, there are several useful and effective treatments for keloids. Although everyone wants their keloid excised (cut off), it is important to know that it is not a successful treatment most of the time. This is because recurrence rates are very high and range from 45% to 100% after scalpel excision. Therefore, excision alone is not recommended as a treatment for your keloid. Excision must be combined with another treatment to prevent the keloid from recurring. Various medical treatments have been used to increase the cure rate of excision, including radiation therapy and injections of cortisone (see below). Excision, when coupled with these therapies, has a significantly improved chance of cure. Laser excision of keloids has been performed with both the argon and CO2 lasers. Much like the case with scalpel excision, recurrence rates are very high. The use of laser in conjunction with other medical therapies, such as injected steroids, has lead to improved results. However, in one study treating over 800 patients with keloids with various lasers combined with steroids, the keloids tended to recur once steroid injections were stopped. Keloidal scars have been treated with some degree of improvement with the pulse dye laser, which targets the blood vessels in the scar. This will decrease the blood supply and theoretically the keloid will shrink. However, the pulse dye laser does not totally remove the scar. Instead, it reduces redness and the size of the scar and leaves the scar softer and less itchy or painful. Sometimes the laser is combined with injections of steroids to flatten the scar more completely. Injections of steroids are used in the treatment of keloids either as single treatment or as medical treatment after the excision of a keloid. Steroids appear to work by decreasing collagen production. Triamcinalone acetonide (Kenalog) in the concentration of 10-40 mg/mL is the most commonly used steroid for the injection of keloids. It is injected into the keloid every 3 to 4 weeks and for a total of 6 to 8 treatments. The actual injection is mildly to moderately painful and takes about 3 minutes. At times, liquid nitrogen is applied before the injections to increase the ease of injection. In general, liquid nitrogen pre-treatment is not recommended for brown skin as it can lead to permanent discoloration of the skin. Although the steroid injections do not completely remove the keloid, they decrease the size of the keloid substantially. One study found that 88% of keloids injected with triamcinalone acetonide decreased in size to varying degrees and that itching disappeared within 3 to 5 days of injections. If the keloid is removed first, then milder concentrations of the steroid (2.5 - 10 mg/ml) are injected to prevent recurrence of the keloid. Again, this treatment requires monthly injections for up to 6 months. Some dermatologists will recommend topical steroids although they are unable to penetrate into very thick keloids. Side effects may be seen with the use of injected steroids, including loss of pigmentation in the keloid or the surrounding skin, thinning of the skin, and the growth of red blood vessels on the skin. Radiation treatment either alone or after excision is effective in treating keloids. The most frequently used treatment is superficial, low dose x-rays given within 10-days of surgery. Response rates have ranged from 64%–98% after excision of the keloid and recurrence rates are low. The treatments occur on an outpatient basis, at a hospital, and may occur over 5 to 7 days. Although people may worry about the development of cancer, it is estimated that the risk for developing skin cancer from radiation exposure is low. Although the dose administered for the treatment of keloids is indeed low, long-term follow-up is needed to determine the actual risk for development of malignancy. Injections of interferon alfa-2b, which inhibits the fibroblasts' ability to synthesize collagen, is performed after the keloid has been removed. In a few studies, interferon has been effective in the decreasing the recurrence rate of the keloid. Side effects have included flu-like symptoms. More studies are needed to more definitively determine the effectiveness of this treatment. Silicone gel sheeting has been used for the treatment of keloids, although the exact manner in which they work is unknown. The silicone gel sheeting, such as Epi-Derm, Sil-K, Cica-Care, ReJuveness, DuraSil, and Silastic Gel Sheeting, are believed to reduce recurrence rate of keloids after excision. The overall effectiveness is uncertain and further studies are needed to draw definitive conclusions. Since the treatment of keloidal scars is so difficult, many dermatologists will use several treatments at once. They may include a combination of excision-intralesional steroids-pressure earrings or excision-intralesional steroids-silicone gel sheets. One investigator reported a 15% overall recurrence rate in treating 202 patients with head and neck keloids with the combination of excision-intralesional steroids-silicone sheeting- radiation therapy. Keloids can be very difficult and frustrating to treat. None of the currently available treatments work in all cases.At times, multiple treatments will be necessary and they still may not completely reduce or eliminate the keloids. What is most important is that you give the treatment at least 4-6 months to work. Also, remember that there is ongoing research focusing on keloids, so we are hopeful that one day a cure will be found. For scientific information on keloids, refer to Dr. Taylor’s paper Keloidal Scarring (Shaffer J, Taylor SC. Keloidal Scarring. Journal of the American Academy of Dermatology 46(S2): 63-97,2002).